We have changed all our product prices on themezee.com from USD to EUR. This change was made to simplify things on our end. We are located in Europe and therefore have to keep books in our currency. It was getting increasingly complicated with PayPal payments in USD, because every single transaction had to be converted and recorded in Euro. Along with that change we have introduced a new currency switcher on our checkout page. We know that many of you are not used to Euros and will find it difficult to grasp the value of it. But with the new currency switcher our shop will also display the price in USD, which means you can still judge our prices at the first glance. As result the change should not affect you greatly. With our new prices in €, the dollar price has changed slightly. As you can see the price for the single pro version is now slightly higher and the price of the premium bundle a little bit lower. We will adjust the prices in case the currency exchange rates make big jumps. Another advantage of our currency switcher is the support of 27 different currencies, not just Euros and US dollars. 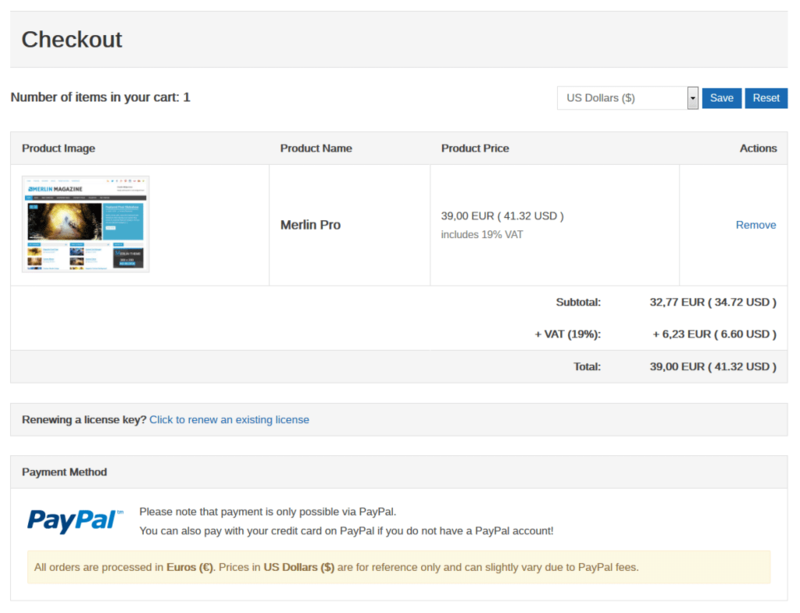 Our checkout page will now display the converted price in your currency, no matter where you are located. Please note: Orders will always be processed in Euros. The displayed prices in other currencies are for reference only and can slightly vary due to PayPal currency exchange fees.